What we put into our bodies is even more important than what we apply to it on the outside, so I wanted to share my current daily supplements routine to explain why I take what I do and why they could possibly work for you too. Over the years I have experimented with many different brands of supplements and I've come to the conclusion that quality is definitely key when choosing 'the one'. Yes, you can pick up various supplements and vitamins for bargain prices these days from deep discount sellers both on the highstreet and online, but I find that a lot of these have unnecessary fillers and bulking agents added to them and I would prefer to seek out a more pure and natural form instead. That's not to say that you have to spend an absolute fortune on them though, just check out the ingredients list carefully and shop around. I struggle with tiredness on a daily basis, mainly because I've always had some problems with sleeping, and also because I have a natural B5 deficiency which has been tested by numerous GPs. To remedy this, I like to take a specialised B5 supplement to help rebalance my body as B5 is essential in helping to reduce tiredness and fatigue. This formula from Viridian also contains Quercetin which is a natural anti-histamine so it's useful for those who suffer from hayfever. I still take conventional anti-histamines alongside this, but I find that I can take less of them now and I don't have any side effects from the Quercetin. I featured this in my June Favourites and I've been taking it everyday since. Organic Liquid Iron is a unique liquid supplement which has extracted the iron from Murraya koenigii leaves and is blended with Seagreens Organic Artic Wrack Seaweed, Guava, Lemon, Nettle, Dandelion and Amla. It looks like a thick, green syrup mixture and I'm not going to lie - it doesn't taste particularly great but the results are definitely worth it. When I use this, I notice that I'm less tired than usual and that it works well in conjunction with the Quercetin B5 Plus Complex to help fight off fatigue throughout the day. As I suffer from ezcema flare ups throughout the year, I did some research into what I could potentially take in a supplement form to help ease these and I read a lot about the benefits of Hyaluronic Acid. My skin has always responded well to topical skincare products with Hyaluronic Acid so it sounds like a pretty good idea to see if it will work when consumed internally. These capsules not only have Hyaluronic Acid but they also have Lipowheat which is a natural, vegan source of ceramides that are essential to keeping healthy skin cells active and happy. I haven't noticed any differences yet, but I'm going to try these on a more long term basis to see if I do. Keep an eye out for an update in the near future. Do you use any vitamins / supplements? I tried some supplements from Viridian in the past and would definitely buy from them again as they are such a good quality with no unnecessary stuff added to them. I am currently taking supplements from Together but once I finish those I will probably look at Viridian again. 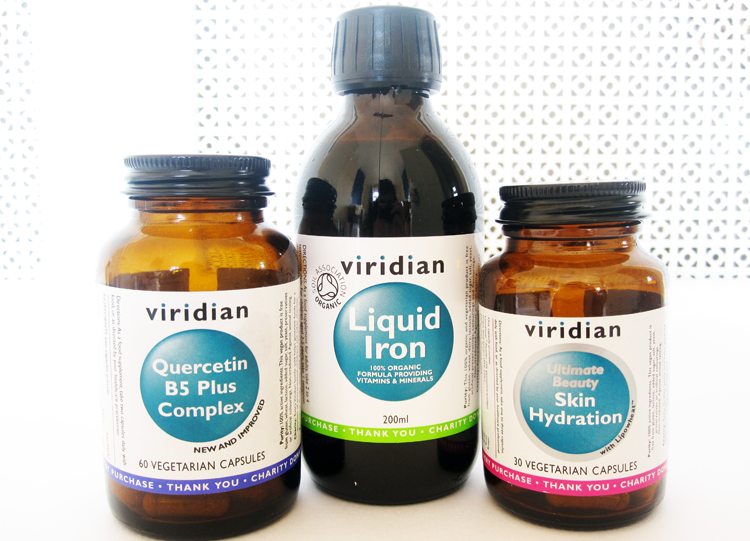 I'm taking supplements from Vertese and Optibac and they're working well but I have considered Viridian, especially as they're veggie friendly.